I’m not taking orders yet, but I will be soon. 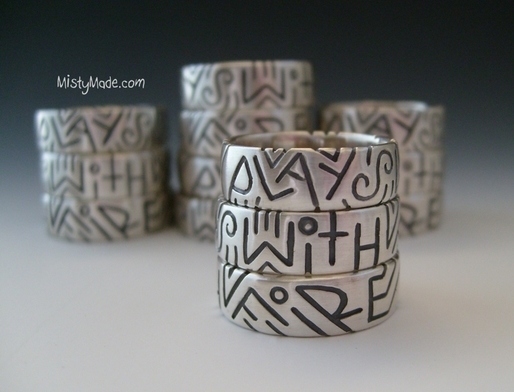 The PWF ring is a single ring that has the words "Plays With Fire" carved around the band. It is cast in sterling silver (by me) and it comes with an antiqued finish. The smallest size I will have available is size 5 and the largest size I will have available is size 11. Half sizes and quarter sizes will be available. ***Please note*** These rings have a wide band (starting at approximately 6 mm depending on the size) so they fit a bit more snug on the finger. If you are unsure of your ring size, please visit your local jewelry shop and ask them to size you with a wide band ring sizer. 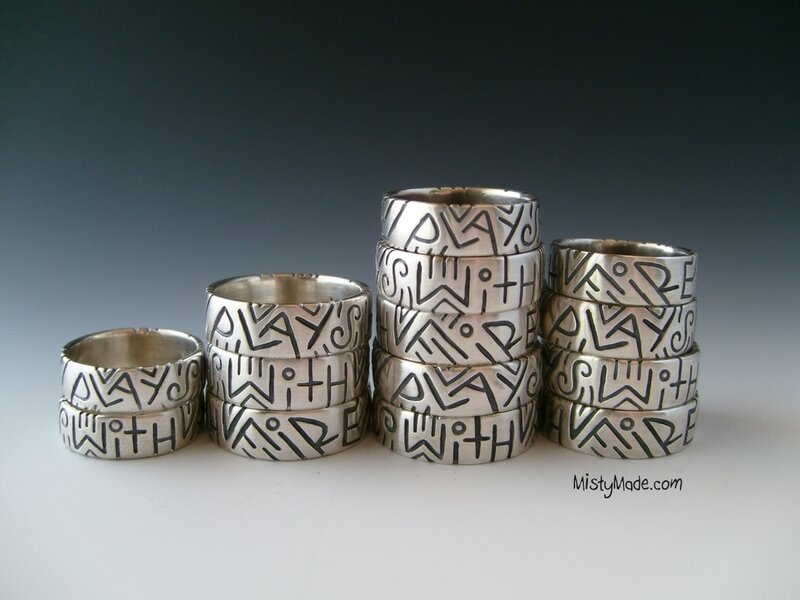 The “plays with fire” ring started out as a single ring that I carved for myself. The photo to the right shows the ring after it was cast. I was really excited about the ring and I showed it on wetcanvas.com. I received many messages from people saying that they loved the ring and they wanted one. So I made a mold of the original ring. 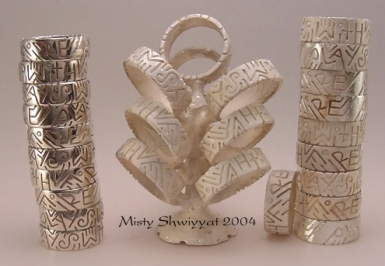 Once the molds were made, the rings quickly multiplied. 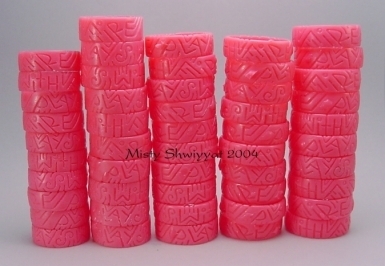 This photo shows some of the rings after they were cast. The rings are in various stages of finishing. This is a photo of the PWF ring after it has been polished. This is a photo of the PWF ring after it has been antiqued with liver of sulfur then brushed with steel wool to make the blackened carved areas pop! back in 2004. Over the years I've had many people tell me that they still wear their ring and they still love it after 10 plus years. That makes my day!!! When I’m at a glass event and I see someone wearing one, I can’t help but smile from ear to ear!